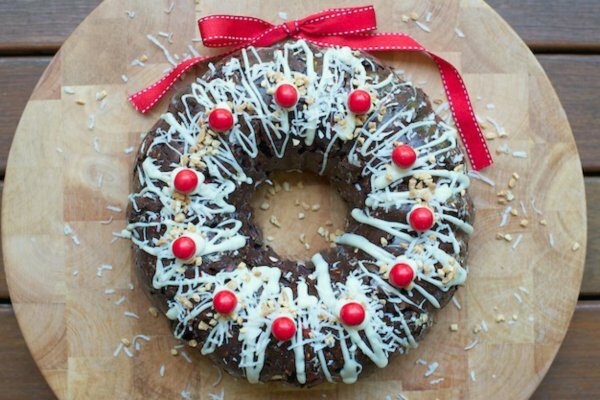 Christmas baking ideas: The no-bake, rocky road Christmas wreath. Introducing the rocky road Christmas wreath that's perfect for those of us who can’t cook. I love a bit of Christmas tack. 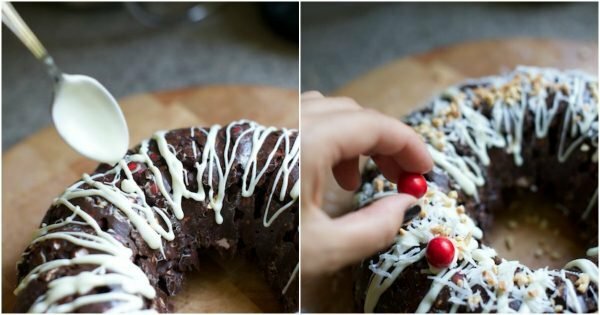 Rocky road in the shape of a Christmas wreath? Why the hell not? This is a TRUE Phoodie recipe. Fun. Simple. Impressive. Delicious. If you’re celebrating Christmas with a special lunch or dinner, this NEEDS to feature on your table of deliciousness. Annnnnnnnd if you do PLEASE send me a pic. You can do this on Facebook, Twitter or Instagram or you can email it through. If you like rocky road you may also like this Mint Chunk Rocky Road recipe and this white chocolate cookies and cream rock road recipe. Speaking of the festive season, the internet has blessed us with Christmas eyebrows, and we can see ourselves getting into it. Butter up your bundt tin in preparation for step number 3 – be generous with the butter. The last thing you want is for the wreath to get stuck. 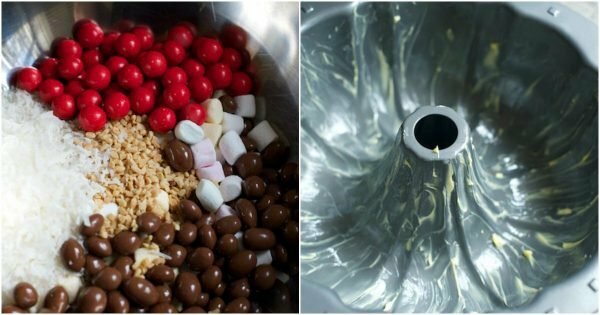 1) In a large bowl, place the marshmallows, peanuts, coconut, Jaffas and chocolate coated peanuts. Mix with a wooden spoon. Just measure and mix! Image: Supplied / Phoodie. 2) Melt the dark chocolate either over a double boiler or in the microwave (if doing it in the microwave be careful not to burn it). 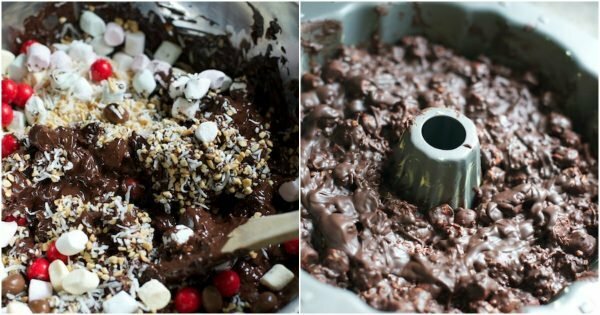 3) Wait for melted chocolate to cool slightly and then pour over all other ingredients. Stir together immediately and transfer to a butter lined 24 cm bundt tin. YUM. Image: Supplied / Phoodie. 4) Place in fridge to set for a few hours. 5) Remove from fridge and allow to come to room temp (not melt if it’s hot where you are). Remove from bundt tin. DON’T FREAK OUT if it doesn’t come straight away, if you have used enough butter it will come. 6) Melt the white chocolate and drizzle over the top of the wreath with backwards and forwards motions to create a rough zig zag (see pics). Sprinkle over additional coconut and crushed peanuts and use white chocolate to ‘glue’ the Jaffas around the wreath, evenly spaced. And decorate as you please! Image: Supplied / Phoodie. 7) To present, lay on a flat board and place bright red or green ribbon tied in a bow at the top-centre. Will you try this rocky road wreath recipe? What&apos;s your favourite thing to bake at Christmas? Tell us in a comment below. This post originally appeared on Phoodie and has been republished here with full permission. 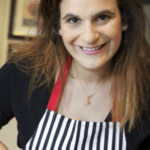 For more delicious recipes you can visit Phoodie on Facebook and Instagram.